This is a collection of patches to integrate Kryptopyr's excellent Complete Alchemy and Cooking Overhaul with specific other mods. I have asked for permission from the authors of all included mods. You have my permission to do as you wish with my patches provided you also have their permission. Please do not do anything with my patches the original mod authors do not grant permission for. Vigor patch: Updated for Vigor 9.1. Copied over the change in the magnitute of the leg injury debuff. Vigor patch: Updated for Vigor 7.1. Just removed some unnecessary edits to the curative magic effects. Vigor patch: Updated for Vigor 6.1. 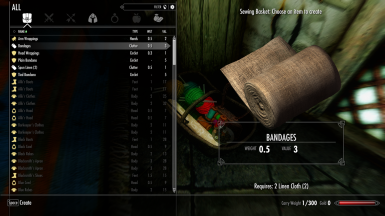 Renamed Vigor's "poultice" to "salve" and it no longer requires bandages. Marked some items as obsolete and made them redeemable for their equivalents by clicking them. Vigor patch: Updated for Vigor 5.3. Disabled the potion-only poultice recipes from 5.3, but made recipes require less ingredients/output more poultices to make up for it. Vigor patch: Fixed some mistakes left in the new poultice recipes. The aloe recipes no longer require a potion in your inventory. Vigor patch: Minor changes for the update to CACO version 1.2. Also some changes to make trauma cure poultices easier to get. Apothecaries stock twice as many as before (thanks to KayronDS for the suggestion). 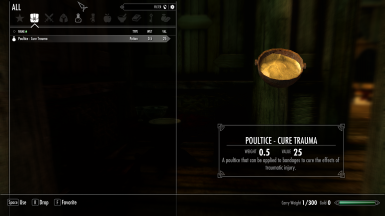 Trauma cure poultices can be made in a cooking pot with wheat, red mountain flower, and a healing potion, without requiring the Physician perk. If you have the Physician perk, you can make the poultices in a retort out of wheat and aloe vera, without a potion. Vigor patch: Removed new poultice crafting mechanic for consistency with CACO. Vigor version 3.4 has some interesting ideas and I'd like to merge them better with CACO when I'm done with my latest project. For now I somewhat reluctantly keep the old system, to prevent weirdness with CACO. 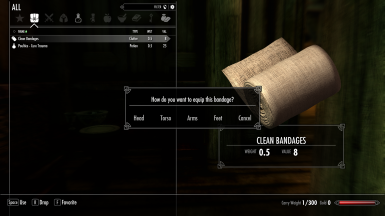 Vigor patch: Added Survival recipe for crafting bandages, as requested. Less efficient than crafting at a tanning rack, so uses 4 linen wraps instead of 3. Interesting NPCs patch: Uploaded! Thank you to kristakahashi for giving open permissions for such patches. Konahriks Accoutrements patch: Uploaded! Thank you to edhelsereg for granting me permission to share this. ClothingCraft patch: added optional versions to include or not include Tanning Rack versions of some recipes using Campfire's Survival skill, and to include or not include the ability to grow Northern Flax in Hearthfire planters. Fixed some recipes to be as I intended, rebalanced effects of Northern Flax, and made each Northern Flax plant yield a number of ingredients. Solstheim - The Lost Levels patch: Rebalanced effects of added alchemy ingredients. Some of CACO's ingredients I incorporated into this mod were unfinished and not fully integrated into CACO, I've fixed this. If kryptopyr makes these ingredients a proper part of CACO, I'll carry over her changes. Changed the effects of some of the ingredients, inspired by what their effects were in Morrowind. Vigor patch: Incorporated optional Campfire version. With this, Vigor's own Campfire patch is unnecessary. Vigor patch: cure trauma poultice recipes all require a retort and can be crafted from a healing potion, wheat and a third ingredient - red mountain flower or aloe vera. Vigor patch: Carried over changes from updates to Vigor (for real this time). Removed not-in-combat condition from the curative magic effect. Vigor patch: Carried over changes from updates to Vigor. Changed Curative description to clarifiy it does not work in combat. Updated Vigor - Combat and Injuries patch for Vigor 2.2. There is no longer a separate potion to cure torso trauma, and you can apply a torso bandage with the salves from CACO. Also includes some general improvements to the Vigor patch such as a unique texture for the cure trauma poultice. Thanks to Excinerus for allowing his meshes and textures to be used and modified. Changed Survival Recipes for bandages to require 3 pieces of cloth. So you can make a bandage without any tools, but less efficiently than with the proper tools. Uploaded ClothingCraft and Solstheim - The Lost Levels patches! 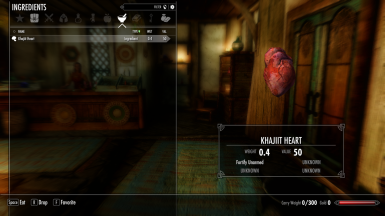 Heart Breaker patch: - Added unique textures for each heart. Improved Artifacts patch: replaced the other duplicate ingredients with CACO's version. Thanks, smythny! Also, retexture for the Spriggan Heart. I hope it looks good enough. Vigor patch: Renamed Salve of Mending -> Poultice - Cure Trauma and Potion of Bodily Mending - Potion of Cure Torso Trauma. Fixed bug that prevented Heart Breaker heart meshes from appearing. Cleaned up installation folders for all patches. Changed the weight, value and keywords of Heartbreaker's hearts to be consistent with CACO. Heart Breaker - A Killmove Mod - replaces the Elf heart from that mod with CACO's and adds unique effects that are consistent with CACO to the other new hearts. Adds unique textures to each heart. Optionally includes a fix so that you cannot get two hearts from Humans and Elves, one from Heart Breaker and one from harvesting with the Anatomist Perk. Improved Artifacts Collection - replaces all ingredients also featured in CACO with CACO's version. 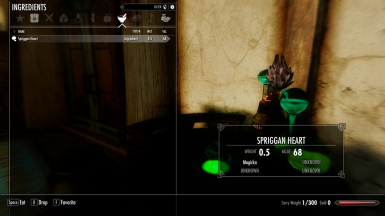 Brings the effects of the only unique ingredient, the Spriggan Heart, in line with CACO, and gives it a simple retexture to distinguish it from Briar Hearts. Should make it so that you can only extract Spriggan sap from Spriggans using CACO's method. Vigor - Combat and Injuries - integrates CACO and Vigor's bandages into one hopefully seamless system. CACO's clean bandages can be applied to stop bleeding, with or without a poultice. A new poultice to cure Vigor's trauma effects can be applied to CACO's bandages. As no bandages are available for the torso, a unique potion is instead used to cure torso trauma. This patch replaces Vigor's poultice and bandage recipes and will conflict with any mod modifying them. Make sure my patch is loaded after any such mods. In addition, CACO's bandages can now be applied to the feet and torso. As this requires a different script than CACO's own bandage application script, you may need to remove then put back all bandages in your inventory when updating for the script to trigger. This is the most extensive patch. I have tested it briefly and looked over it thoroughly, and all seems to work as intended, but please let me know if you encounter anything unexpected in the course of your play. If you desire a simpler method of integrating these mods, try Extra CACO Compatibility Patches by spacegorilla1. Note: Regarding the optional file Improved Enchantment and Alchemy Effects.esp, I do not see any way to resolve the conflicts with CACO, except for perhaps including the effects from both mods. However I think this would be unbalanced and maybe defeat the purpose of the changes made by the mods. For now, I strongly recommend loading Improved Enchantments and Alchemy Effects.esp before Complete Alchemy & Cooking Overhaul.esp, or leave it disabled, for CACO to work properly. ClothingCraft - adds Wiseman303's Flora Fixes to the Northern Flax plant and brings the ingredient's effects in line with CACO. Adds water as a requirement for dye recipes and replaces spider eggs with CACO's spider silk in the silk recipes. Bandages can be crafted from two like pieces of cloth at a tanning rack or sewing basket, or from three pieces using Campfire's Survival skill. A bowl of Flax Seeds can be extracted from 8 Northern Flax at a tanning rack (couldn't think of any place that made sense) or again with Campfire's Survival skill (recommended). Also renames the vanilla head and arm bandages, which are craftable in ClothingCraft, to "Head Wrappings" and "Arm Wrappings" to distinguish them from CACO and Vigor's healing bandages. Optionally be able to grow Northern Flax in Hearthfire planters. Solstheim - The Lost Levels - Replaces any ingredients also featured in CACO with CACO's version, and brings the rest in line with CACO. Fully integrates some ingredients from CACO that were not finished. Adds Flora Fixes to the new flora. Grahls will now drop Grahl eyes and troll meat. As some of these ingredients from CACO seem to not have been given meshes, I assigned them the meshes from this mod. I will remove that change if CACO is updated with meshes for them. Gehenoth - Replacer plugin, let it overwrite the original Gehenoth.esp. Makes Gehenoth Eyes and Gehenoth Claws consistent with CACO. More than one of each ingredient can be gathered from each Gehenoth, and Gehenoth Eyes now require the Anatomist perk to harvest. Cutting Room Floor - Tiny patch that just changes the Frost River Mead added by Cutting Room Floor to fit in with CACO. Konahriks Accoutrements - changes Dragon Priest ashes to be consistent with CACO and optionally MorrowLoot Ultimate. Replaces uses of vanilla Heartscales with CACO Heartscales. Load after my equipment patch for Konahriks Accoutrements if you use that. Automatically changes some recipes to fit better with Complete Crafting Overhaul Remade if it is installed. Interesting NPCs - makes effects of added food and ingredients consistent with CACO. Makes some tweaks to related items such as empty bottles added by the mod. Adds some recipes unlocked after completing the relevant quests. Changes some quests, dialog, etc to better reference CACO's ingredients. Load after my equipment patch for Interesting NPCs if you use that. 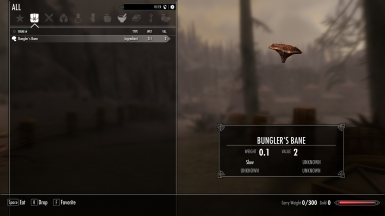 This is the first mod I'm uploading to the Nexus. I hope it all works smoothly. Please let me know if you find any errors and I will do my best to correct them. Also let me know if there any other patches for CACO or ClothingCraft you would like to see made. Provided it isn't too complex or time-consuming, and that I can get the necessary permissions, I will probably be up for it.